If you dream of Mac laptops you’ll like this one. From the looks of things, there’s a MacBook Pro 15″, MacBook Air 13″, MacBook Pro 13″, MacBook Air 11″, and a mystery Mac behind the the top two (maybe another MacBook Air 13?). 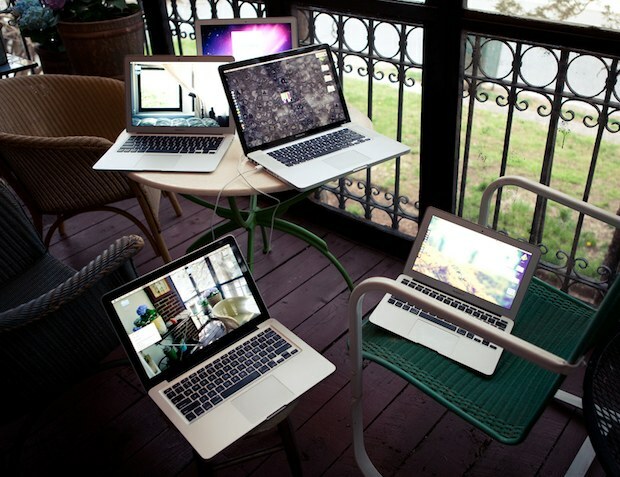 All these Macs belong to Garrett Murray of ManiacalRage. If you’re wondering why there are so many Macs in the picture, it’s because he’s transitioning his household from the heavier MacBook Pro’s to ultraportable MacBook Air’s. The Macbook Air is a great machine so I’m not surprised that people are moving from heavier models to the ultraportable lineup. I just wish the Air had a Core i5, 8GB of RAM, a black screen bezel, and a glowing keyboard, but that’s me being picky. i5 CPU… 8GB RAM… SandForce controlled SSD (not just any SSD)… and of course, a dedicated GPU. Because some people need better specifications then the macbook air can deliver. And I use a disc driver every day so the air is not for me.